Season the beef with the garlic powder. Heat the oil in a 10-inch skillet over medium-high heat. Add the beef and cook until well browned on all sides. 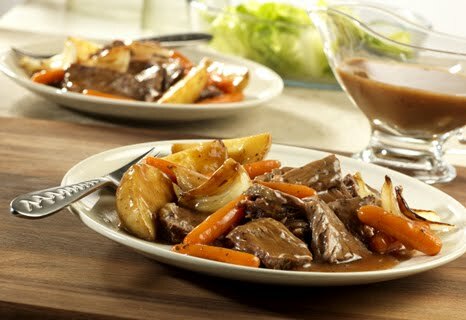 Place the potatoes, carrots and onion into a 3 1/2-quart slow cooker. Sprinkle with the basil. Add the beef to the cooker. Pour the gravy over the beef and vegetables. Cover and cook on LOW for 10 to 11 hours* or until the beef is fork-tender. *Or on HIGH for 5 to 6 hours.